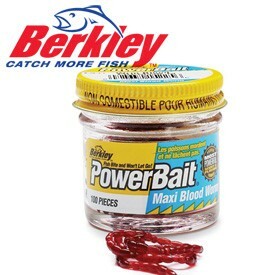 Berkley Powerbait Bloodworm MaxiThe Berkley Powerbait Blood Worm is the perfect bait for many fishing situations. It can be used on the hook, on a hair or to hide the hook completely. The Blood Worm is extruded using 100% biodegradable material and has the exclusive Berkley Powerbait Formula infused within each worm. The tough texture means that it is long lasting and can be used many times.This imitation Bloodworm has been made famous over the years in many DVDs promoting carp fishing, its main purpose as a hook disguise and as a line aligner to flip the hook over! Berkley Powerbait Bloodworm Maxi The Berkley Powerbait Blood Worm is the perfect bait for many fishing situations. It can be used on the hook, on a hair or to hide the hook completely. The Blood Worm is extruded using 100% biodegradable material and has the exclusive Berkley Powerbait Formula infused within each worm. The tough texture means that it is long lasting and can be used many times. This imitation Bloodworm has been made famous over the years in many DVDs promoting carp fishing, its main purpose as a hook disguise and as a line aligner to flip the hook over!